“The Gigster” three piece drum kit. Tired of lugging five or six piece drum kit around town. 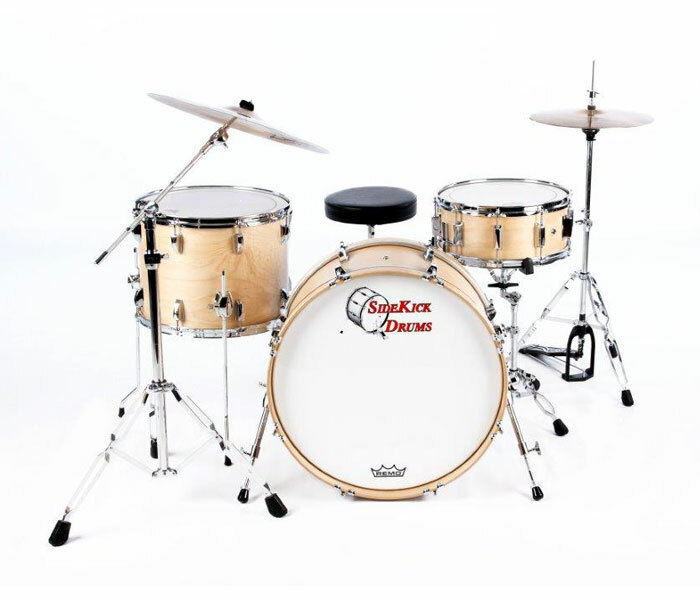 The Gigster offers a compact three piece kit comprised of a 12″ x20″ kick drum, a 12″ x 16″ floor tom and a 6″ x 14″ snare (you may substitute the snare drum for a 8″ x 12″ ride tom). This is not a wimpy travel kit. These drums will give you all the sound you need from small venues to festivals. Handcrafted and made from Keller maple shells, Evans heads and nice hardware. Available in maple (as pictured), red mahogany, burnt orange or ebony stain as well as any of our wrap finishes. Wraps are an additional cost (see drum wrap page to order). *Add a 12″ x 8″ rack tom for $200. Cymbals, hi-hats and throne sold separately.